After the over doze of Christmas cakes, cookies, puddings and everything sweet, this potato roast served as an accompaniment for our simple meal, today. 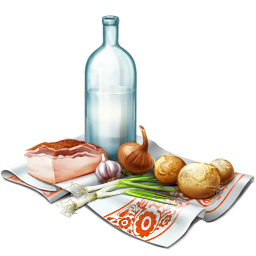 This dish is something I make very frequently for children, particularly as a side dish for their pack away lunch. An absolute kid freindly accompaniment! Peel skin, wash and dice potatoes. Heat oil in a non stick kadai. Splutter mustard seeds and brown the urad dal until golden brown (not too brown as it will get roasted further in the next stage) . 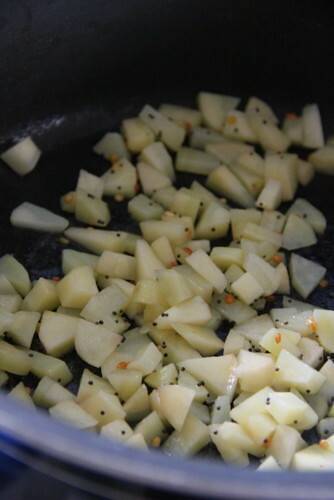 Throw in the diced potatoes and combine gently. Add salt and let the pieces get roasted for 2-3 minutes in low-medium flame. 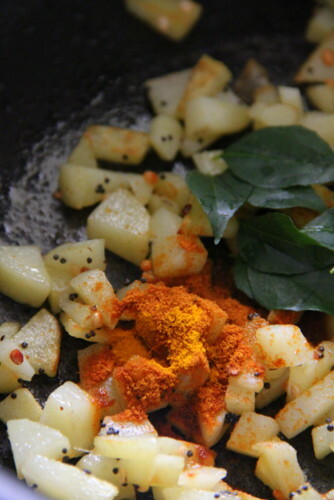 Tip in the powders, sambhar and turmeric, followed by the curry leaves. Toss or stir to combine and roast for another 3-5 until the spices coat the pieces and they are roasted well. Drizzle a few drops of oil at this point if needed. 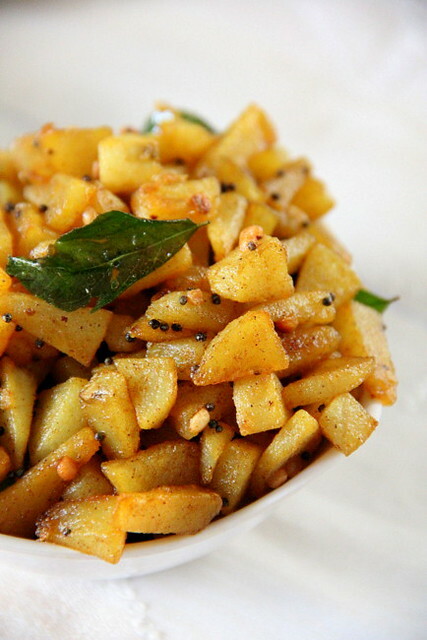 Check salt and serve hot with steamed rice, rasam and appalam. *If you don't have sambhar powder, you can substitute with 1/2 tsp of chilly powder + 1/4 tsp of coriander powder + a pinch of cumin/jeera powder. This won't alter the taste of the final dish. To be honest, I blogged it a bit too hastily, within 30 minutes; while the pictures where getting uploaded to flickr, the recipe was typed. The publish button was clicked within the next 5 minutes. I don't think I had done a blog post so quickly so far. Thanks to the easy and comforting dish! 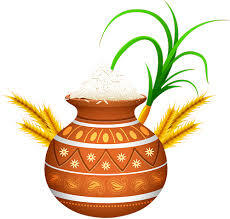 Wishing you a very Happy 2013 Bharathy. wow :) my all time favourite ! have u tried adding the coconut oil at the end :) wow divine is the word ! We too are having light meals after overdoze of butter and sugar. 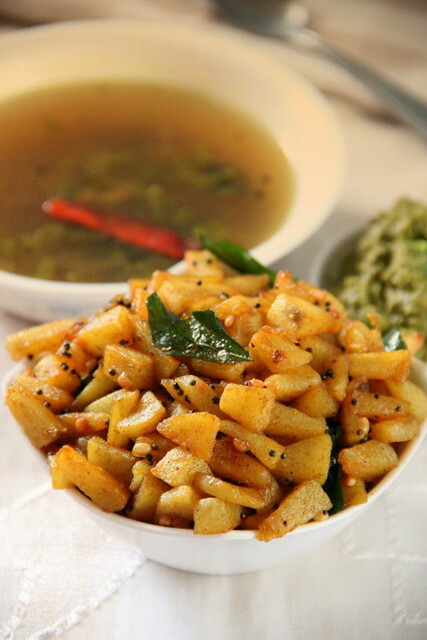 nice simple meal..
My all time favourite, who can resist to these potato roast.Love with curd rice. PerfectO! 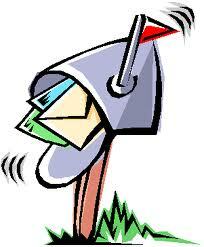 Wanted to comment on your Kothu Parotta also.. will do in sometime! Now I want the fiery kothamalli chutney recipe as well... Pls to post! Happy New year... heres to a awesome 2013! Potato is always a comfort food. 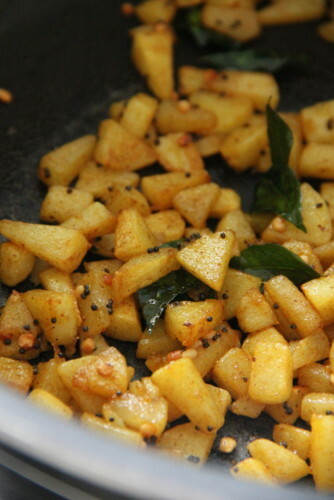 I use a different masala to make a similar potato dish. This one looks interesting and tasty. Nice quick post. Happy New Year! oh!!! everybody's favorite!!!! love the simple and homey curry!!! 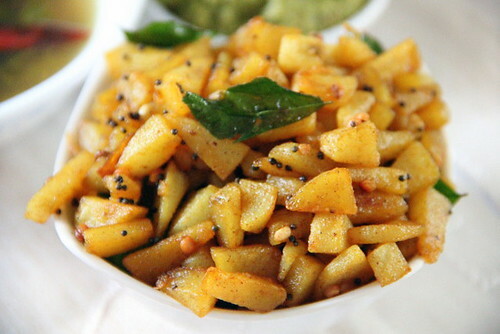 Potato raost....looks like it is calling me to take some :) Lovely clicks! !